Dear God, I know that it is Christmas and I am supposed to be focused on the birth of Jesus, but once again Advent came and went and all I did was focus on so many other things. So, this Christmas, please help me remember a few simple things, even if I am stressed from shopping and travel, lonely from a lack of friends and family, sick from a difficult illness or poor from the lack of work or a living wage. This Christmas, please help me remember a few simple things. Help me remember that when you became human, you came into the world in the most vulnerable way possible—as an infant. That meant that you were totally dependent on Mary and Joseph to care for you. And when you left this world, naked on a cross, you were vulnerable, too. That shows what you were willing to do just to love me. You were vulnerable for me. Help me remember that when you came into this world, it was not into some powerful clan in Galilee, not into some great ruling family of Judea and certainly not into a royal dynasty in Rome. You could have come in power and exercised that power as a scholar, a soldier, a king or an emperor. Instead, you came with no earthly power at all. You were powerless for me. Help me remember that you came into the world in the most vulnerable way possible—as an infant. Help me remember that you could have entered the world in a wealthy family. There was no need for you to be born to a young, probably illiterate woman who was married to a simple carpenter and who lived in a town so insignificant that one of your disciples would make a joke about it. But you chose not only to enter a poor family but to toil for many years as a laborer yourself. You were poor for me. Help me remember that you spent most of your life in obscurity in Nazareth, living an everyday life and working as a carpenter alongside Joseph. You were not well known. You did not set out to make a big name for yourself. In fact, the Gospels barely mention your hidden life in Nazareth, the place you spent your first 30 years. That is how simple, obscure and uneventful most of your life was. You were unknown for me. Help me remember that when you became human you took on a human body. That means that you experienced everything that anybody does. You had stomachaches and headaches, got colds and the flu, experienced hunger and thirst, and grew weary at the end of a long day. It also means that you experienced joy and sadness, frustration and anger, and all the emotions that any human being does, even in your divinity. You were human for me. Help me remember that your entire life, from your birth to your death on a cross, was spent in love. Help me remember that your entire life, from your birth to your death on a cross, was spent in love. You loved Mary and Joseph and your whole extended family. Later, you loved your friends, disciples and followers. You loved even your enemies and persecutors. And you had a special love for anyone who was poor, sick, lonely, misunderstood or marginalized in any way. Your entire life was poured out as one great offering of love. You were love for me. Help me remember that you offered yourself without counting the cost. You preached the good news to the poor, healed the sick and shared the coming of the reign of God with everyone. Not everyone wanted to hear your message, but you kept proclaiming it until your death. You gave your whole self for humanity, even when we rejected you. You gave up even your body and spirit on the cross. You were everything for me. Help me remember that Christmas is only the beginning of the story. Help me remember that Christmas is only the beginning of the story. After your death, you returned as the Risen One, never again to die, offering hope in the face of despair, love in the face of hate and life in the face of death. Your rising on Easter Sunday revealed the same message that the angel told your mother when he announced the coming Christmas: Nothing is impossible with God! You are life for me. Dear God, I know that I don’t always remember these things at Christmas. There are so many emotions swirling in my head this time of year. But I want to remember them. And I trust that the desire to remember them is itself a good thing and comes from you. So that I can become love for others. Thank you, Fr. James, for writing the perfect prayer for me. Yes, Advent went and I was busy.... Trying to get more into the Spirit in me that will make me aware of Jesus. One point is that I think Mary was literate! And carpentry was a good profession at the time. Criticizing a prayer?! Now that's unkind - as well as unnecessary. Just go read some "unsappy" prayer book. I recommend Augustine's Confessions. It is one, long beautiful prayer, and does not read like a Hallmark card. A message of unselfish love can only be heard by a sap and a fool who thinks like a child. That's for sure! But it doesn't have to be wordy and overly sentimental, like this. Thanking Christ for His story and example in language true to the heart, that speaks for and to those who are often unspoken for and unspoken to is as near perfect orthopraxy as you get. How shameful your heart is so burdened with vitriol that you feel the need to force that upon with others rather than take this into your own heart. True. My initial remark was mean-spirited and out of place. I apologize. I was not referring to the content, but to the way it was expressed. I do believe it is wordy and sentimental. Thank you, Father. I struggle to look within and truly appreciate all of the blessings in my life. This is more than a Christmas Prayer for me. Praise the Lord in the manger. Happy Christmas. 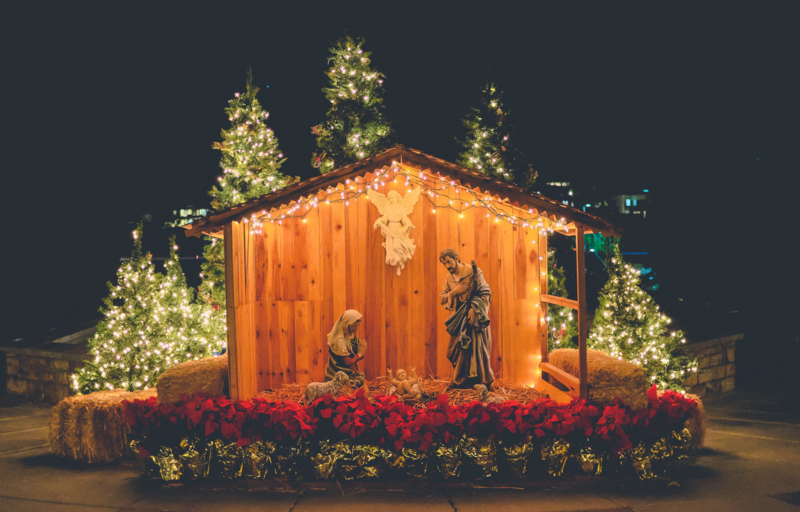 More: Christmas / Prayer / James Martin, S.J.